No not that White Zinfandel crap you see people drinking (although it is made from Zinfandel grapes, it’s an off-dry/sweet grape juice if you ask me). This is a traditional huge California Zinfandel. I’m not sure if you can make it out in the picture but you read that label correctly: 16.6% alcohol content. Zinfandel is known for two things: big flavor and high alcohol content. If you aren’t ready to take the bull by the horn then this wine might not be for you. – Grown in Croatia as Crljenak Kaštelanski and in Italy as Primitivo. – Controversy over grape DNA (yes, grape DNA): Scientists conducted DNA tests to find the roots of Zinfandel after realizing that both the Italian and Croatian grapes taste remarkably similar to Zinfandel. The result? Both have a common ancestor grape…Tridibag…another Croatian grape that has been around for centuries. Zinfandel, Crljenak Kaštelanski, and Primitivo have been regarded as synonyms for many years but in the United States that’s no longer acceptable. – Often referred to as “Zin”. – Depending on where the grapes are grown the wine can have very different flavor. The cooler climates lead to jammy and fruity wines while the warmer climates lead to spicier wines. On to the 2007 Opolo Vineyards example. Moby and I brought this bottle to a birthday party and unfortunately we really didn’t get to try enough of it to form a solid opinion. There were 6 people trying it and then the last 1/4 of the bottle was lost when someone dropped it. Whoops! There was a broken wine glass, wine in the dip, wine on the cake, a minor hand injury…it lead to much comedy throughout the night so it was still fun. Thankfully it was only a $20 bottle! But what did it taste like? It was very very jammy and had huge fruit flavor. This was a seriously big wine. You could really notice the 16.6% alcohol content also. I nursed my glass through the salad and lasagna since we were out of wine but it turns out it was a good thing because this wine 100% needs food. WIthout food you may as well schedule a nap after your first glass because this wine will beat you senseless. All that being said I actually don’t mind Zinfandels. Big wines can be fun in the right environment, you just have to know what you’re getting into. Zinfandels don’t have a true calling like Cabernet and steak…but if you’re looking for a big wine other than Cabernet give Zinfandel a try. 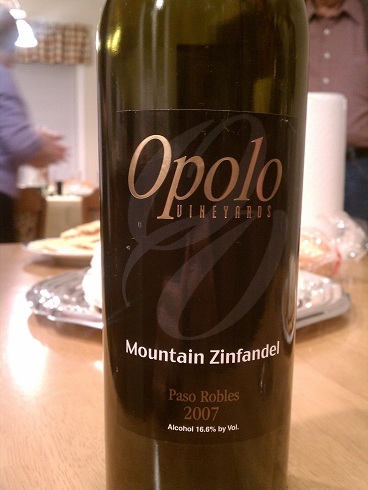 This entry was posted in California, United States, Zinfandel on December 22, 2012 by colonelgrape.